Rear sight for the S&W M&P Shield, 9/.40. These sights are precision CNC machined from prehardened 4140 bar stock, and are designed to withstand the rigors of hard duty use. The sight features a U notch for fast alignment with tritium dot or brass bead front sights. The rear face is serrated at 40 lpi to reduce glare in varied lighting conditions. The sight blade is thick enough to allow setting tritium vials as dots or bars if one so chooses, and is contoured and dehorned for comfortable handling and carry. Finished in black salt bath nitrocarburizing, equivalent to the factory finish on the slide, for superior hardness and corrosion resistance. Mfg: 10-8 Performance Llc The rear sight is compatible in height with the factory front sight (.160" tall x .140" wide), and can also be used in conjunction with 10-8 Performance M&P front sights. 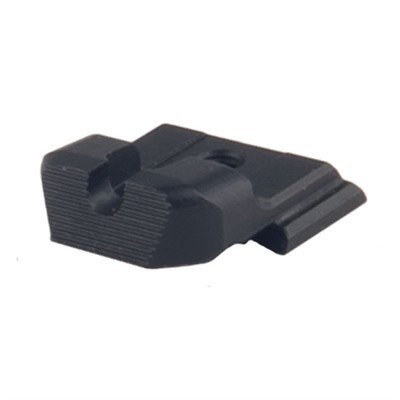 Rear sight height is identical to the factory sight, and will not change point of impact.